Out now on Metalville Records. Hitting their 10th anniversary, Swedishn traditional metallers Astral Doors celebrate their sixth studio album with “Jerusalem”. If you’re new to the band, simply said they are straight up classic metal ala Dio/Tony Martin era Sabbath or Dio. A classic guitar/Hammond tag team over a driving rhythm section coupled with the vocals of the Dio/Jorn Lande-esque Nils Patrik Johansson, a fine vocalist who just happens to have sung on some of my favourite albums with Richard Andersson’s Space Odyssey. “Jerusalem” for the most part is more of the same, bred from the same pot that produced their other works and whilst it may all seem a little too predictable to some, the band manage to maintain your attention throughout with good riffs and strong hooks. Nothing overtly fancy or pretentious just good riffs, a solid back beat and a charismatic frontman and really its all you need. The production however is not quite as strong as on earlier albums ala “Of The Son And Father” and “Evil Is Forever” but again not too much to gripe about. Highlights are plentiful from the opening assault of “7th Crusade”, “Pearl Harbour”. “Babylon Rise” shows a slight variation in the bands theme taking some unexpected turns. “Suicide Rime” is sure to get some dandruff flying at gigs whilst fans of epic productions will be well pleased with “The Battle Of Jacob’s Ford”. Overall album number 6 doesn’t through up any real surprises, yet the quality of song writing is still on a par with albums of yore. 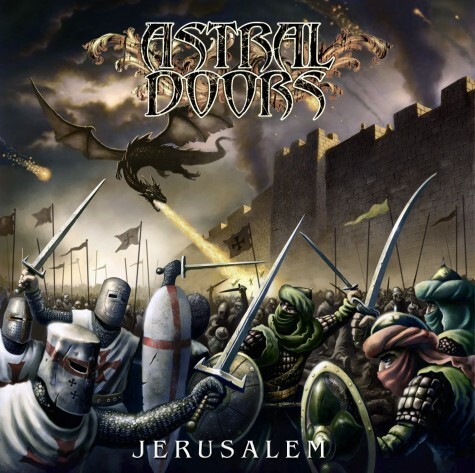 Solid and dependable, get some Astral Doors into your life with “Jerusalem” being as good a place to start as any. This entry was posted in Reviews and tagged Astral Doors, Jerusalem, Nils Patrik Johansson, review, Richard Andersson. Bookmark the permalink. Mark Reale has passed away. An unsung hero if ever there was one. His trademark guitar playing helped define Riot, one of the classic American metal bands. His work with Westworld showed another side to his songwriting. An underrated guitar player in underrated bands, Mark Reale wasn’t a household name. Arguably one of melodic rocks best bands returns with their first album of new material since 2007. During this time House of Shakira has undergone somewhat of a line-up change with a new rhythm section of Basse Blyberg (bass) and Martin Larsson (drums). But perhaps the most risky change was that of the lead vocalist position. Replacing the well respected Andreas Eklund is thankfully another gem of a vocalist in Andreas Novak (ex Mind’s Eye and solo). Any preconceived concerns about the new line-up are quickly dissolved with opening brace of “Brick Wall Falling” and “Changes In My Mind”. 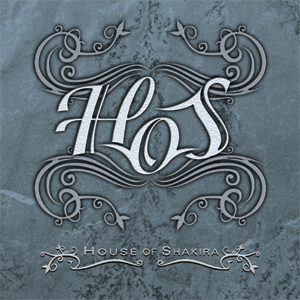 House of Shakira are definitely back with one hell of a wallop, powerful yet full of melodic charm these two tracks represent perhaps the most urgent tracks the band have produced in years. The slightly heavier/darker edge to much of the music on offer fits well with Novak’s confident vocals which have a nice mix of emotion and strident delivery. Guitarists Mats Hallstensson and Anders Lundstrom have never been a guitar tag team short of class but here they sound pumped through a succession of strong riff hooks and tasty lead work. That’s not to say the bands classic sound is missing for its here in most tracks just delivered a little different – dare we say with more enthusiasm? The production is strong, live sounding, few overdubs and probably represents the bands acclaimed live show well. It responds nicely to being pumped through a decent hi-fi or headphones at high volumes. Melodic rock anthems are well catered for in chest thumpers like “Carry My Load”, the radio sheen of “Fractions Of Love” (Def Leppard would kill for a track like this in 2012), “I’ll Be Gone”, “Out Of My Head” and “Voice In The Void” where the bands mix of commerciality and rocking delivery is all present and correct with some of the best vocal and backing vocal hooks you most likely will hear in 2012. Novak’s arrival also sees the band move into some newer territory as heard on “All Aboard!” and “Midnight Hunger” which rock profusely with the band sounding like they have been let off the leash, it’s a fun new edge to the bands output and works nicely. Ballads are kept to a minimum on “HoS” with “Lost In Transition” being the only number that could fall under such a banner, whilst mid-tempo country-ish waters are tread in “What Goes Around” with its killer chorus. Overall, “HoS” marks a fine return from one of the best melodic rock bands going. This the sound of a band revitalised and perhaps with a point to prove in 2012. Fans of honest hard rock with a strong dose of melody are well advised to check this out pronto. A contender for melodic rock album of the year already. This entry was posted in Reviews and tagged Andreas Novak, Def Leppard, first class, Hard rock, HoS, House of Shakira, lint, Melodic Rock, review. Bookmark the permalink. Lillian Axe have gone through quite an evolution. They kicked off with a trio of hard rocking classics, culminating in the masterpiece “Poetic Justice”. With every new album since “Psychoschizophrenia” their sound darkened. Yet they never lost what made them uniquely Lillian Axe. It’s no different on this new album. The riffs, melodies and songstructures are all instantly recognisable. Overall the new album is more upbeat than the last two, which doesn’t hurt, to be honest. Tracks like “Take The Bullet” were missing for too long. It seems the band (well, Stevie Blaze) is returning to its roots. This album sounds closer to “Poetic Justice” than it does “”Deep Red Shadows”. It’s interesting to note that while newcomer Brian C. Jones has a rather different voice from his predecessors, his vocals are a seamless fit. Standout tracks : the epic “Death Comes Tomorrow”, “The Great Divide”, the furious “Caged In”… Take your pick, there’s not a duffer on the album. There’s nothing more to say really. 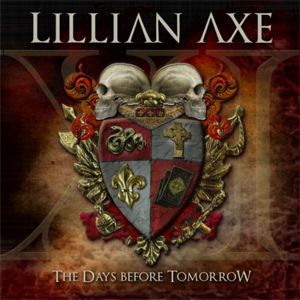 Lillian Axe have released yet another great album. Their best since “Poetic Justice”. This entry was posted in Reviews and tagged Lillian Axe, Poetic Justice, review, Steve Blaze, The Days Before Tomorrow. Bookmark the permalink.